Today I am launching a new editorial series focused on best practice communications from other academics. Every Friday, I will highlight one academic who is strategically leveraging the power of digital communications. I will do a quick analysis of what he/she is doing well and provide examples of best practice that can be gleaned from the individual highlighted. The goal of this feature is that if you are an academic or thought leader looking to establish an online presence, you will be able to draw on this archive and use it as a source for inspiration in creating / refreshing your own personal brand presence. A new professor will be published most every Friday with the previous posts archived as a reference point. Title: Professor at McGill University; Co-Director of the Advanced Leadership Program, a program run jointly with renowned management guru Henry Mintzberg. While many professor blogs focus solely on their own thought leadership, Professor Moore does a great job of bringing in other voices and opinions into his content through interviews with thought leaders. For example, interviews with the likes of Harvard Professor Michael Porter and Joint Chiefs Chairman Marty Dempsey can be found across his channels. If you are a thought leader / academic and don’t know where to begin in establishing your online presence, then think about individuals who would make for an interesting interview. Ditto if you are have an online presence but are stuck on what to write about next. Personally, I find interviewing individuals on my own content platforms to be a great way to learn about new things myself. Odds are, some readers / viewers will find the individuals you interview to be of interest as well! Secondly, few professors would see the value of sharing photos of students from classes or trips. Most probably see this as part of the marketing department’s job. 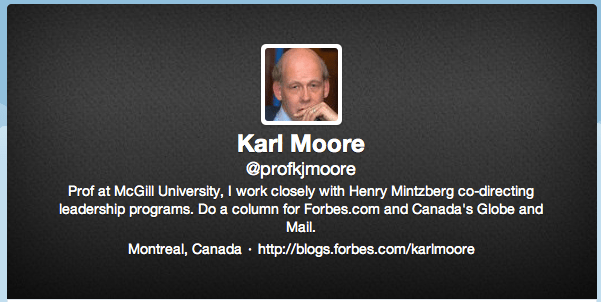 Professor Moore’s twitter feed features photos of experiences with students in the classroom and on trip. This is an important attribute of humanizing his brand and bringing his following into the classroom. In my opinion, such images mean more coming from a personal professor’s account as opposed to a faceless brand. What images can be sprinkled into your channels that would compliment other forms of existing content?